This class can be used to intercept runtime errors of PHP scripts. It registers a PHP error handler function that outputs the details about the errors to a given log file. 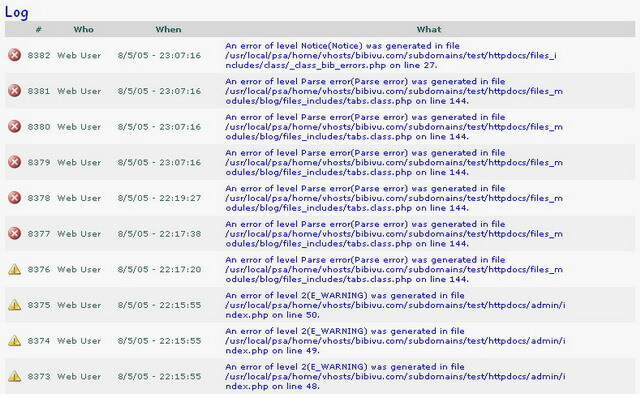 The errors may also be displayed as part of the current script output or sent by a given e-mail address to let the site administration or developer react promptly. Now has been update to be compatible with PHP5 and the new variables declaration. you can also define a function that you want to user to log errors in a database or something else this function is called ONLY if log_errors = 1 leave it empty if you do not have any LOG functions. in this case I pass a function that is in the $bibivu class, called 'write_log' previously declared.